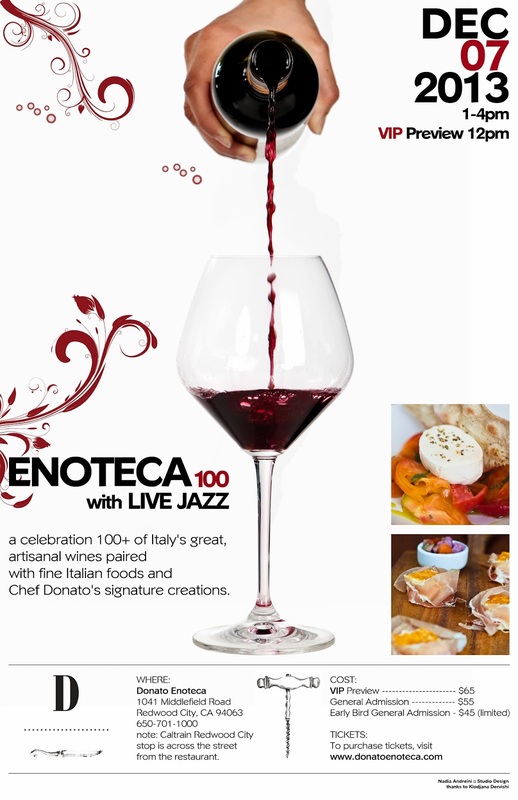 Donato Enoteca 100 2013 - upcoming Italian wine tasting extravaganza here again! It's almost December. And the annual Enoteca 100 tasting is upon us again. Do not miss. You can get $10 off with a coupon code mentioned in the COST section below. I never used to love Italian food as much, until I started loving Italian wine. That love affair with vino drove me to explore and appreciate Italian cuisine, which in turn nudged me to explore even more of Italy's wine regions and varieties. No other place has helped open my eyes to all that more so than one of my favorite restaurants in the Bay Area - Donato Enoteca. Not only do they serve great food and wine all year around, they also feature some of my favorite winemaker dinners. And once a year, Donato Enoteca throw their annual Enoteca 100 Italian wine extravaganza. This year, it's on Saturday, December 7. I documented this event in the past -- highly recommended for sheer joy of living! Festive Sparkling wines from all across Italy! Grilled Wild Prawns, Agnolotti del plin, Milk Braised Baccala. Saturday, December 7, 1-4 p.m. Note: Caltrain Redwood City stop is across the street from the restaurant. Note: as a reader of this blog, you may use "ironc" discount code to save $10 off the ticket price. Enjoy! Following a recent fantastic showing of Clape Cornas documented here, I had the pleasure of a focused Cornas dinner, organized by my friend Scott, which is turning into something of an annual event. I have to admit - a tasting simply cannot compare with actually drinking the wines over the course of several hours with food and company (and licking off drippings off the bottoms of the "dead soldiers" the next morning, with an unadulterated palate still in-tact :) At the fabulous dinner hosted at Domaine du Chevsky (i.e. my house), we once again confirmed greatness of the 2010 vintage in Rhone, as both August Clape and Thierry Allemand showed spectacular. All wines displayed zesty olive-tapenade and herbal notes resting atop of deep dark smoky fruit. Excellent acidity gave the wines energy and precise shape. The big boys Clape Cornas 2010 and Allemand Cornas "Reynard" 2010 were dense, sappy and structured, with Allemand showing more pepper-spice-box and tobacco aromatics and flavors, while Clape had more Cab-like graphite, smoke, darker fruit blanketing the peppery spices and a bit silkier texture. But the real surprise was the Allemand's "Chaillot" - the wine was simply beautiful (after 1 hour decant), open, super-fragrant, full of exotic pepper spices and zesty herbs (that I kept referring to as "magic dust"), beautiful iron-infused fruit and acidity that titillated my palate - an enormous pleasure to drink with Scott's delicious braised lamb over polenta sprinkled with gremolata-like mixture of garlic, parsley and lemon-zest. I had under-estimated this wine a couple of weeks ago at a tasting. The dinner confirmed the super-expressive beauty of this "lower-ranked" vineyard of Allemand, poised for mid-term pleasure. The other two are long-term powerhouses, though the Reynard seems more approachable with a longer decant. For vintage comparison, we also had a 1998 Clape Cornas (with a cheese course), and while good, it was leaner, rougher and nowhere near the flash of the 2010's, and I don't think it's just the age - the 2010's are just superb, period. The next morning, that zingy irony delicious spice-box still lingers in my thoughts and on my taste buds. Another tasting of Clape and Allemand at a local wine shop did nothing to dispel my appreciation for these two producers. The wines were opened 2 hours prior to the tasting. 2007 Allemand Cornas "Chaillot" - expressive nose of spices and red iron-infused fruits. Palate: those same red iron-infused fruits, expressive, delicious, tart, saliva-inducing zingy acidity, energetic, spice-box, iron, pretty and somewhat elegant (should become even more so with time) wine with tons of juicy character, really quite intense, strong impression on the palate and lasts a long time. Still quite tannic. Fireworks! 2001 Clape Cornas - I believe this was FLAWED, probably prematurely oxidized. Stewed nose, a bit too mature/caramelized/advanced. Palate: deep pine, plums, meat, spicy acidity, less of the caramelized character that I got on the nose, but still there. Disappointing. 1996 Clape Cornas - aha! clean nose, still tight, fragrance of herbs and spices, some meat and plum. Palate: much better than the 2001. Clean and fresh, balanced with nothing sticking out, gentle spice, iron, leather, olive tapenade, meat, pine, iodine. Somewhat lighter than the recent Clape Cornas I've had, quite aristocratic actually, and polished wine with beautiful personality and dare I say elegance. Tannins almost fully resolved, drinking near its peak now, but so fresh that there is no hurry. Clearly more reserved than the 2007 Chaillot, but that's perhaps apples and oranges.